Col. Abraham (Abram) Penn was born in Goochland or Amherst County Virginia in 1743. He married Ruth Stovall in 1767 in Amherst County, Virginia. Shortly thereafter, he moved to Henry County, Virginia and lived on Beaver Creek, land which later became the home of Col. George Hairston. When Henry County was formed in 1776, Abram Penn was the presiding justice of the County Court. He organized and commanded the Henry County troops in the Battle of Guilford Courthouse in the American Revolution and was at the Surrender in Yorktown. Sometime after the War, Col. Penn sold his Beaver Creek property to Col. George Hairston and purchased large acreages of land on the headwaters of the North Mayo River, which later became a part of Patrick County. 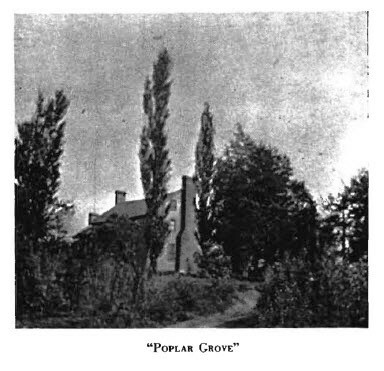 He built a home here, which he named Poplar Grove. With his large family, he lived here until his death in 1801, and is buried in the cemetery near the house. In 1786, the people in the western section of Henry County (now Patrick Country) complained that the Henry County Courthouse which was located across the Smith River from Hordsville, was too far from the center of the County. The County Court decided to move the courthouse to the farm of Col. Penn, which was nearer the center of the County at that time. At least one session of the Court was held in the home of Col. Penn. Later, a courthouse and necessary adjacent structures were built nearby. Unfortunately, no one now living seems to know exactly where the courthouse was located. In 1791, when Patrick became a county, the Henry County Courthouse was located in Patrick County. The Henry County Courthouse was moved to its present location on land donated by Col. George Hairston. Due to the influence of Col. Penn and his son-in-law, Col. Samuel Staples, the Patrick Courthouse was moved to its present location. The building here now is probably an addition, which was later added to the Penn home. One section of the old home was torn down only a few years ago. The original structure has long since disappeared. The remaining section is rather old. A family member says it was added about 1836. Poplar Grove sits on an eminence overlooking the low land of the North Mayo River Valley. The poplar trees, for which it was probably named, have long since disappeared; but it can easily be seen that the view from the house in those days was a beautiful one. Col. Penn's descendents continued to live at Poplar Grove for many years. A son, Thomas Penn married Martha K Kennerly, and their daughter, Eliza, married Samuel William Hairston, the operator of the iron works at Union Furnace. Some of the iron was brought to Mayo Forge, which was located on the river just south of Poplar Grove. Here it was made into tools and farm implements. A large number of the descendents of Col. Abram Penn have been prominent in the affairs of Patrick and Henry County, Virginia since the beginnings of the counties. Many descendents have also been prominent elsewhere. Descendents were prominent in the manufacture of tobacco products. Greenville Penn, son of Col. Abram, moved to that section of Patrick County now known as Penn's Store, and started manufacturing tobacco products. His son, Thomas Jefferson Penn, moved to Danville and engaged in the tobacco business. He later moved to Reidsville, N.C. and established a business, which became the American Tobacco Co.
Photo from "The Hairstons and Penns and Their Relations" by Elizabeth Seawell Hairston.